GetMinted Bingo was one of the first brands to be launched by Cashcade and is part of the Dragonfish network. It's age shows clearly on the homepage with a design that is clearly outdated in comparison with many other brands available on the Internet today. The landing page far from entices to your to register and play at GetMinted with a black background at limited information about the product. If you do choose to register rather than click the back button and find another brand to play at, it takes just a few minutes to complete the sign up process. As soon as this is done you are taken to a screen that appears to only have a 'Deposit Now' option but you will find a 'play now' link in the text below, this will take you to the bingo lobby of GetMinted. It's here that you will find a very familiar feel if you are used to the Dragonfish network with the usual layout . The lobby is the hub of GetMinted Bingo, the place to find details of all the games offered and details of ticket prices, room numbers and jackpots available in each room. 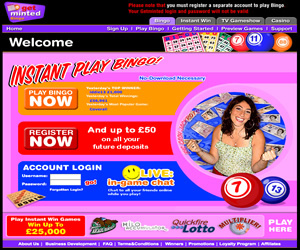 The site offers three variants of the online bingo game, 75 ball pattern and five line games as well as 90 ball bingo. In addition to the standard pot prizes there are also daily jackpots available to pre-buy and of course, the site is home to the £1 million coverall game that plays three times a week. Although the top prize has never been won on any of these games (despite them running for a number of years now), they do pay out guaranteed jackpots of between £500 and £1,500 each. 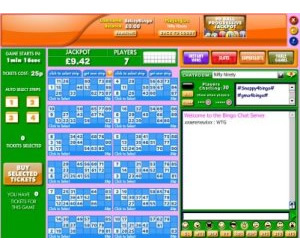 When in a bingo room you are also offered the option of having a little side bet on your bingo, both through the Side Bets feature where you bet on the bingo game and via the instant win games available too. The chat at GetMinted Bingo is quite difficult to follow at times simply because the site is networked and player numbers are high. If you are looking for the social aspect of the online game then you will find it difficult to get responses from hosts as the chat room seems to be filled with 1TG, WTG, GL etc. However, participating in chat can be quite lucrative if you win a chat game. Loyalty points are awarded and these can be converted into bonus funds for bingo play. Sadly GetMinted Bingo doesn't appear to have been shown much love since its launch and seems to have been left to fester. However, you do get exactly what you expect if you register to play here. GetMinted Bingo offers three variants of the bingo game at their site. Most games are either 75 ball pattern or 90 ball bingo but there are rooms that offer 75 ball five-line games too. 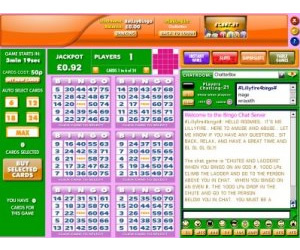 You will find a selection of instant win games like slots, scratchcards and table games available, some of which can be played in the same room as your bingo. A minimum deposit of £10 is required for cash match bonuses. Wagering requirements at GetMinted Bingo are 4x the amount of deposit and bonus but you can withdraw prior to meeting these requirements. However, should you not have met the wagering then your bonus money in your account at the time of withdrawal will be lost. Before you can withdraw you must have deposited at least £30 into your account.